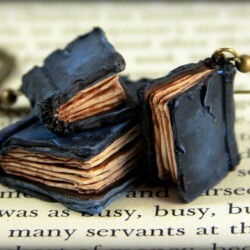 The transition between page 5 and 6 – that’s how far I got before the first teardrop threatened to roll down my cheek. I mean, you’re obviously bound to cry at one point when you’re reading something that deals with themes of death and grief but that’s a record, even for a book bawler like me. I believe that’s a testament to how powerful Carol Rifka Brunt’s writing is. Greta knows that for me there are no good parties. I’m okay with one or two people, but more than that and I turn into a naked mole rat. That’s what being shy feels like. Like my skin is too thin, the light too bright. Like the best place I could possibly be is in a tunnel far under the cool, dark earth. Someone asks me a question and I stare at them, empty-faced, my brain jammed up with how hard I’m trying to find something interesting to say. And in the end, all I can do is nod or shrug, because the light of their eyes looking at me, waiting for me, is just too much to take. And then it’s over and there’s one more person in the world who thinks I’m a complete and total waste of space. Finn was more than June’s uncle. He was also her godfather and her best friend – the person she looked up to the most. His death affected her in ways that no one, not even her own family, understands. She doesn't want to move on, doesn't want to forget. I wondered what would happen to me without Finn. Would I stay stupid for the rest of my life? Who would tell me the truth, the real story that was under what everybody else could see? How do you become someone who knows those things? How do you become someone with X-ray vision? How do you become Finn? On the day of Finn's funeral, she notices a strange man lurking in the perimeter. Later she finds out that this mysterious man is Toby, Finn's boyfriend. Her family warns her to stay away and her sister tells her that he's the reason that Finn got sick and died. But Toby reaches out to her in secret, and June is torn between feeding the seeds of hate her family has sown and giving herself the chance to learn about this side of Finn she never knew. 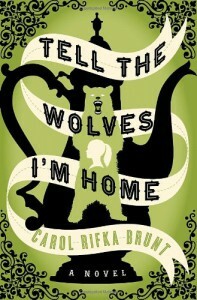 Tell the Wolves I'm Home is most described as a coming of age story. I do hate saying that because that term is so overused and so clichè but really, I can't think of a more appropriate term. This is about the transition from childhood to the cusps of adulthood, thinking you know all there is to know about something and someone, to realizing that you knew nothing at all. It's about the loss of that childhood innocence and the confusion that comes with experiences gained. At this stage in her life, June feels lost and misunderstood. She's unsure of whether to trust Toby, but she feels like he contains the only piece of connection to Finn that she's not ready to let go of yet. "Come here." Toby patted the spot next to him on the bench, and I scooted over. He put his arm around my shoulder and pulled me in so my face was pressed up against his big coat. I didn't know what Toby was trying to do at first, but I took a long slow breath of his coat and there, like magic, was Finn. Not only lavender and orange but other things too. The mild citrus smell of his aftershave. And coffee beans and paint and things I didn't know the names of but were just part of Finn. This is that book where you wish for certain events to have turned out a different way because the heartache was just too much to bear. But if Finn had not died, we probably wouldn't have met Toby. We wouldn't have known the kind of love they shared and the lengths they went for the people they loved. We wouldn't have known how much good and kindness can come out of one person. This is that book that I wish to gift everybody with and hope that it forever rids them of all bigoted, cruel and jealous bones in their bodies. This is that book that makes me think of how unfair life really is. I finished the book feeling so much love I felt my heart would burst. This is a romance book, but not in the sense that automatically comes to mind. As Finn had said, "Being a romantic means you always see what's beautiful. What's good. You don't want to see the gritty truth of things. You believe everything will turn out right." In the end, it didn't, but I still continued to hope that one day, I'd exist in a world where there is a cure for every disease, where there is no such thing as wrong and embarrassing love, and where nobody ever has to have nobody.